The Angling Trust and Environment Agency partnership was a corporate sponsor of the 30th UK Wildlife Crime Enforcers’ Conference, held near York over the weekend of 2 and 3 December and hosted by Craig Naylor, Deputy Chief Constable of Lincolnshire Police and the National Police Chiefs’ Council’s Lead on Wildlife Crime. Dilip Sarkar MBE, National Enforcement Manager of the Trust’s Fisheries Enforcement Support Service (FESS), was a keynote speaker during the prime Saturday morning session. Dilip explained to an audience of 200 police officers and other partners how the Voluntary Bailiff Service provided an unprecedented opportunity to empower and upskill the angling community, in addition to raising awareness of fisheries crime and initiating a multi-agency approach to share intelligence and support the Environment Agency. Reference was also made to the ‘Building Bridges’ project, focussing upon the integration and education of migrant anglers from central and eastern Europe, indicating the strategy’s breadth and wider contribution. Dilip Sarkar said: “This was a major milestone in raising awareness of fisheries crime and our partnership, which has turned a negative into a positive. This is no longer speculative but clearly evidenced by data concerning the hours and patrols contributed by our volunteers, leading to over 500 incidents being reported this year alone and highlighting the diverse range of matters they have been involved with – from the detection of assaults and burglaries, preventing a bankside suicide and reporting matters involving waste and pollution, to name but a few. Two workshops regarding recruiting and training volunteers and intelligence processes were run by FESS North East Regional Enforcement Manager Giles Evans and Intelligence Manager Gary Thomas. These were well attended, with exclusively positive feedback, leading to more police forces expressing interest in joining Operations TRAVERSE and LEVIATHAN, the Lincolnshire and West Mercia Police-led initiatives targeting illegal fishing and fish theft. For the first time, fisheries crime has also been included in the annual Wildlife & Countryside Link report on Wildlife Crime in England & Wales, publication of which coincided with the Conference. 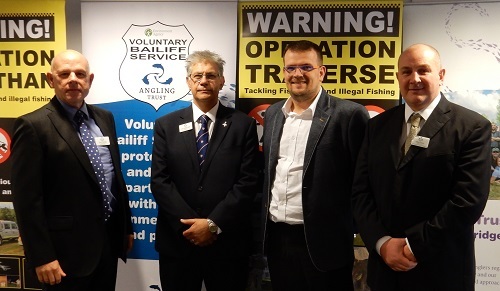 The Voluntary Bailiff Service and Building Bridges are part of the Angling Trust's Fisheries Enforcement Support Service run in partnership with the Environment Agency and funded by fishing licence income.